First Presbyterian offers a wide range of small group opportunities for adults on Sunday and throughout the week. On Sundays at 9:15 a.m. there is a Men's Study group, The Pathfinders Study group, Encourager's Group, and a Ladies' Study Group. Join us in one of these relevant, insightful study groups, where you will learn, be inspired, and connect with others in a small group setting. 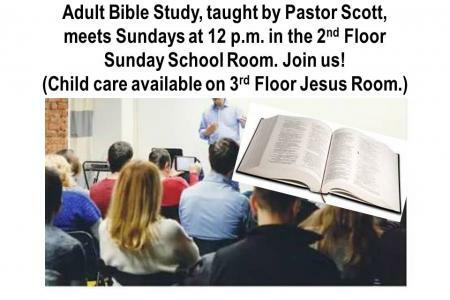 There is also an adult Bible Study taught by Pastor Scott at 12 noon on Sundays. We meet on the 2nd FL in the large Sunday School room . There is a children's small group at noon at the 3rd Floor Children's Center available for children of parents who attend the adult Bible study. And the 20's/ 30's have a great time of fellowship, dinner, and Bible study once a month on Sundays at 5:30 pm, meeting at various venues. Connect with Pastor Sonny for more information. During the week and month we have other study and fellowship opportunities available for men and women. On Tuesdays at 11:45 a.m. the men have a fellowship lunch at the Muddville Grille (on Beach Blvd). Wednesday mornings at 6:45 a.m. is the men's fellowship Bible study and breakfast at Chick-fil-A (JTB & Phillips Hwy). The ladies meeting on Thursdays at 11:00 a.m. in the 3rd Floor conference room for a Bible Study. You're welcome to join them! And the ladies have a monthly "Circle" the first Monday of each month. There is a devotional Bible teaching time, fellowship and outreach projects that the women are involved in to help our community. The "Daytime Circle" meets at the church in Towers Chapel at 1 pm; the "Evening Circle" meets at various members' homes at 7 pm. There is something for everyone at First Presbyterian. Call the church for additional information. You are WELCOME!